The author’s practice adopted a routine of having our clients administer label dose Cerenia® orally the evening prior to any anesthetic event to both feline and canine patients. We had been monitoring the literature regarding this issue but had been initially hesitant to enter into this routine due to the fact that the initial literature was focused on injectable Cerenia®. We were deterred by the costs associated with injectable Cerenia®, the marked sting associated with injectable Cerenia®, and our perceived need to administer injectable Cerenia® a few hours prior to the anesthetic event. When a former employee who was training at Cornell University visited a few years ago, we learned of the routine use of oral Cerenia® at Cornell University given the evening prior to an anesthetic event; we began this same routine shortly afterward. The subjective impression of our staff has been that our patients exhibited substantially less nausea and vomiting associated with their anesthetic events. 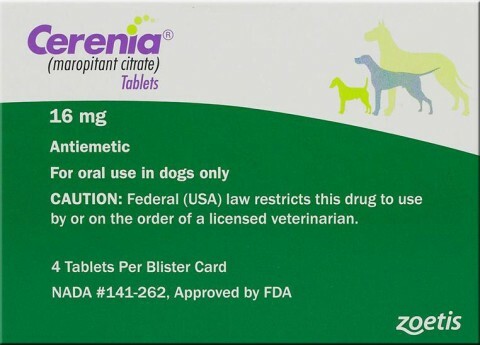 In addition, when following up with our clients over the few days subsequent to the anesthetic event our staff was quite favorably impressed by the number of clients reporting that their pet’s recovery had been superior to previous events that had not included Cerenia®. Client compliance has been nearly 100% and cost to the client is low. We are unaware of any negative potential that might arise from this routine. Maropitant administered orally 2-2.5 h prior to morphine and dexmedetomidine reduces the incidence of emesis in cats. Martin-Flores M, Mastrocco A, Lorenzutti AM, Campoy L, Kirch P, Stone M, Learn MM, Boesch JM. J Feline Med Surg. 2017 Aug;19(8):876-879. Maropitant prevented vomiting but not gastroesophageal reflux in anesthetized dogs premedicated with acepromazine-hydromorphone. Johnson RA. Vet Anaesth Analg. 2014 Jul;41(4):406-10. Efficacy of maropitant in preventing vomiting in dogs premedicated with hydromorphone. Hay Kraus BL. Vet Anaesth Analg. 2013 Jan;40(1):28-34. Effects of maropitant, acepromazine, and electroacupuncture on vomiting associated with administration of morphine in dogs. Koh RB, Isaza N, Xie H, Cooke K, Robertson SA. J Am Vet Med Assoc. 2014 Apr 1;244(7):820-9. Last modified: April 9, 2018 .